Tall, flame-haired sommelier Stefan Neumann MS was born in Austria, and began his hospitality career as a cheese sommelier at Meierei in Steirereck, Vienna. Set in the lush green grounds of the Stadtpark, the restaurant boasts 120 types of cheese, so Neumann had to learn his Roquefort from his ricotta. In 2007 he moved to Restaurant Obauer in Salzburg, where he worked as a commis sommelier. His big break came a year later, when he moved to the UK to work alongside Raymond Blanc at Le Manoir Aux Quat’Saisons in Great Milton, which, like The River Café in Hammersmith, serves as an incubator for talented young chefs and sommeliers. Neumann spent two years at Le Manoir, where he worked his way up from the role of commis sommelier to sommelier, and looked after a bulging wine list of more than 1,000 bins, including an enviable selection of French drops. Swapping classic French cuisine for the beautiful chaos created by molecular chef Heston Blumenthal, Neumann joined the team at The Fat Duck in Bray in 2010, where he stayed for three years, building up the restaurant’s 850-bin list. Having found his stride as a sommelier, Neumann began entering competitions and entertaining the idea of becoming an MS.
Finding a happy home with Heston, Neumann has stuck with the chef, moving to his ambitious London venture Dinner by Heston Blumenthal at The Mandarin Oriental hotel in Knightsbridge in 2013 as assistant head sommelier. Over the past five years Neumann has been a familiar friendly face at Dinner, working his way up to the role of head sommelier in charge of a team of eight somms. Last April he was appointed director of wine for the two-Michelin-starred restaurant, which was blighted by a fire in June just a week after the completion of the most extensive restoration in the hotel’s 115-year history. At the hotel, which played host to Churchill during World War II, Neumann favours balanced food-and-wine pairings rather than creating clashing flavour combinations. He’s not averse to lesser-known wine regions though, and lists everything from Turkish Sauvignon to Chinese Cabernet. During his time at Dinner, Neumann, a self-confessed Riesling fanatic, has served celebs including Brad Pitt and Angelina Jolie, and organised a number of high-profile wine events with the likes of Château Margaux, Louis Roederer and Krug. 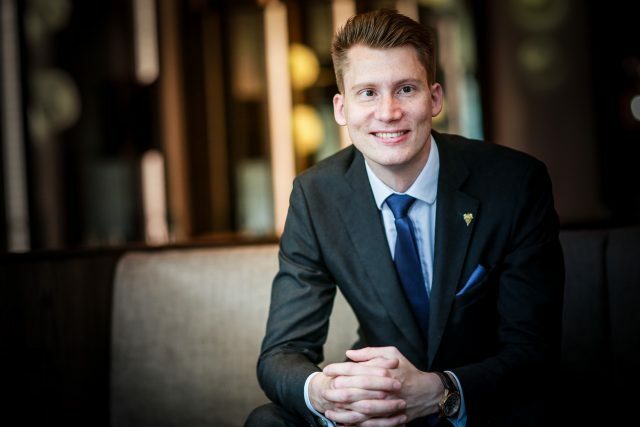 In 2014 he reached the final of the UK Sommelier of the Year competition, and three years later achieved the ultimate accolade of Master Sommelier.